If you’re looking for a simple yet flavorful pork chop recipe, try this one. It calls for only 5 ingredients and is ready in less than 30 minutes, so it’s guaranteed to be a winner on busy evenings. For a tasty alternative, use plain cream of mushroom soup instead and stir in 1 package of dry Ranch dressing mix at the end. This creates a yummy mushroom-ranch pork chop recipe. Serve it with rice pilaf and a green salad. Heat 1 tablespoon oil in a medium skillet. Add four bone-in pork chops and cook until well browned on each side. Stir 1 can cream of Campbell’s mushroom with roasted garlic soup and ½ cup milk into the skillet. Return pork chops to the skillet; reduce heat to low. Cover and cook for 5 minutes or until the chops are cooked through. Serve with hot cooked egg noodles. For a tasty alternative, use plain cream of mushroom soup instead and stir in 1 package of dry Ranch dressing mix at the end. This creates a yummy mushroom-ranch pork chop recipe. Serve it with rice-pilaf-recipe. While searching the web for a breaded pork chop recipe I found about 1000 recipes that looked good. While they looked good , the ingredients were many and the directions confusing. This recipe is easy, tasty and a winner in any situation. This recipe goes well with a green salad, vegetables, and a light dessert such as vanilla pudding. In a medium-sized bowl, whisk together 3 eggs and ¼ cup whole milk. In another bowl, combine 1 cup Italian seasoned bread crumbs and ¼ cup freshly grated Parmesan cheese. Sprinkle 8 uncooked pork chops with salt, pepper, and garlic powder. Dip them in the egg mixture, then the bread crumbs. Place oil in a medium frying pan over medium heat. Place 4 pork chops at a time in the large frying pan and cook for 3 minutes on each side. The pork chops will be only partially cooked at this time. 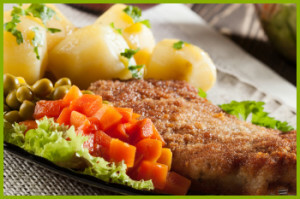 Place the pork chops in a large baking dish and bake for 25-30 minutes. Sprinkle more parmesan cheese and parsley on top afterwards. This recipe goes well with a green salad, vegetables, and a light dessert such as vanilla pudding. For another option big on flavor but short on ingredients this recipe is a winner for anyone trying to create an easy yet elegant meal. heat 2 teaspoons olive oil in a large skillet over medium heat. Season 4 bone-in pork chops with ½ teaspoon each salt and pepper and cook until browned and cooked through, 6-8 minutes per side. Add ½ cup apricot preserves and 1 tablespoon balsamic vinegar to the skillet and cook about 1-2 minutes more. Turn the pork once until the mixture coats all the pork chops evenly. These tangy, sweet chops are great served with red potato wedges, green beans, and rice or couscous! For more tasty recipes like this one, check out Real Simple! Heat 2 teaspoons olive oil in a large skillet over medium heat. Season 4 bone-in pork chops with ½ teaspoon each salt and pepper and cook until browned and cooked through, 6-8 minutes per side. Add ½ cup apricot preserves and 1 tablespoon balsamic vinegar to the skillet and cook about 1-2 minutes more. Turn the pork once until the mixture coats all the pork chops evenly. For something a little fancier, try making pork chops with a simple yet delicious mustard sauce! Heat 1 tablespoon of olive oil in a large skillet over medium-high heat. Place the pork chops on a baking sheet and bake 5-7 minutes or until roasted through. Add two chopped shallots and 1 more tablespoon olive oil to the skillet and cook 3-4 minutes or until tender. Add ¾ cup dry white wine to the skillet and simmer until reduced by half. Add 2 tablespoons heavy cream and simmer until the sauce thickens slightly. Stir in 1 tablespoon Dijon mustard. Top the pork chops with the sauce and 1 tablespoon chopped fresh tarragon. 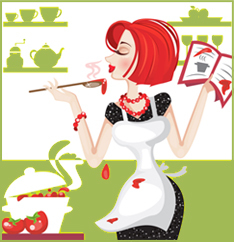 Kendra Smith is a food blogger who enjoys trying and creating new recipes.